A sock is an item of clothing worn on the feet and often covering the ankle and some part of the calf. Some type of shoe or boot is typically worn over socks. In ancient times, socks were made from leather or matted animal hair. 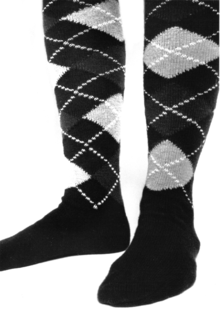 In the late 16th century, machine-knit socks were first produced. Until 1800 both hand knitting and machine knitting were used to produce socks, but after 1800, machine knitting became the predominant method. One of the roles of socks is absorbing perspiration. The foot is among the heaviest producers of sweat in the body, as it can produce over 0.25 US pints (0.12 l) of perspiration per day. 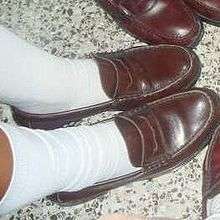 Socks help to absorb this sweat and draw it to areas where air can evaporate the perspiration. In cold environments, socks made from wool insulate the foot and decrease the risk of frostbite. Socks are worn with sport shoes (typically white-coloured socks) and dress shoes (typically dark-coloured socks). In addition to the numerous practical roles played by socks, they are also a fashion item, and they are available in myriad colours and patterns. 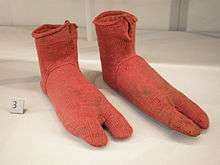 The earliest known surviving pair of socks, created by naalbinding. Dating from 300-500, these were excavated from Oxyrhynchus on the Nile in Egypt. The split toes were designed for use with sandals. On display in the Victoria and Albert museum, reference 2085&A-1900. Socks have evolved over the centuries from the earliest models, which were made from animal skins gathered up and tied around the ankles. In the 8th century BC, the Ancient Greeks wore socks from matted animal hair for warmth. The Romans also wrapped their feet with leather or woven fabrics. By the 5th century AD, socks called "puttees" were worn by holy people in Europe to symbolize purity. 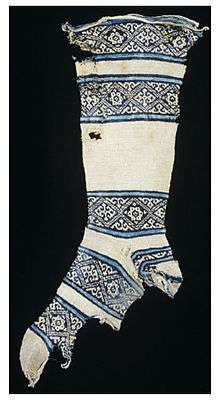 By 1000 AD, socks became a symbol of wealth among the nobility. From the 16th century onwards, an ornamental design on the ankle or side of a sock has been called a clock. The next revolution in sock production was the introduction of nylon in 1938. Until then socks were commonly made from silk, cotton and wool. Nylon was the start of blending two or more yarns in the production of socks, a process that still continues. Socks can be created from a wide variety of materials. Some of these materials are cotton, wool, nylon, acrylic, polyester, olefins, (such as polypropylene), or spandex. To get an increased level of softness other materials that might be used during the process can be silk, bamboo, linen, cashmere, or mohair. The color variety of sock choices can be any color that the designers intend to make the sock upon its creation. Sock 'coloring' can come in a wide range of colors. Sometimes art is also put onto socks to increase their appearance. Colored socks may be a key part of the uniforms for sports, allowing players teams to be distinguished when only their legs are clearly visible. Socks are manufactured in a variety of lengths. Bare or ankle socks extend to the ankle or lower and are often worn casually or for athletic use. Bare socks are designed to create the look of "bare feet" when worn with shoes. Knee-high socks are sometimes associated with formal dress or as being part of a uniform, such as in sports (like football and baseball) or as part of a school's dress code or youth group's uniform. Over-the-knee socks or socks that extend higher (thigh-high socks) are today considered female garments. They were widely worn by children, both boys and girls, during the late-19th and early-20th centuries., although the popularity varied widely from country to country. When worn by adult females, knee-high or thigh-high socks can become the object of sexual attraction and fetishism by some men. Crew socks are short, thick everyday socks usually ribbed at the top of the ankles. They can be used in a way to warm legs. The first familiar practice of crew sock was in 1948. Crew socks are short, thick everyday socks usually ribbed top of the ankles. Crew socks are usually unisex. In the United Kingdom, a sock's size is similar to the person's shoe size; for example, a foot that has a shoe size of 9 would require a sock sized 8-10. In some other parts of the world socks are sized differently than shoes. In the U.S. numerical sock size is the length of the foot in inches, whereas shoe size is not. Sock lengths vary, from ankle-high to thigh level. ↑ "LacusCurtius - Roman Shoes - Soccus". Penelope.uchicago.edu. Retrieved 2010-03-19. ↑ "Sock.". Online Etymology Dictionary]. Retrieved August 28, 2012. ↑ "Russian Army: Footwraps are Out, Socks are in". RIA Novosti. January 14, 2013. Retrieved January 3, 2015.